We sat down to a pint of St. Ambroise and one of Le Filet’s only cocktails, La Piscine. 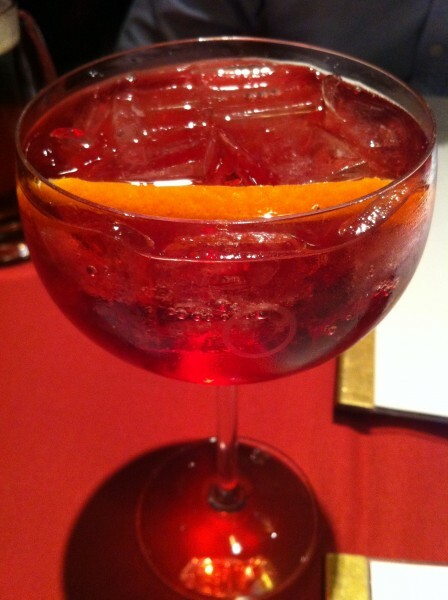 Made with campari, champagne and a hint of orange, it is satisfying as it remains rooted in classic cocktail territory and pleases the palate in a not overly sweet but bubbly way. Le Filet advocates a tapas style way of dining which suited us just fine. We like to share our dishes and sample one anothers to get a little taste of everything. This had us starting off with the flounder with Japanese prune, wasabi and miniature cubed cucumbers sprinkled over top like confetti. Super tender, pleasantly cold and noticeably fresh, the fish was consumed in all but two bites each. 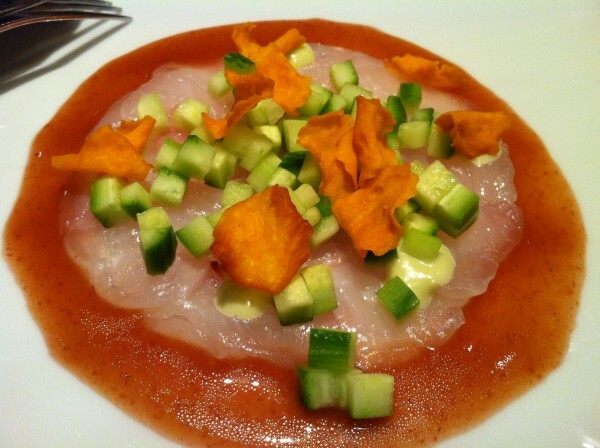 The hint of sourness from the prune and the spiciness of the wasabi mixed together with the flounder… divine. Next we had the scallops with avocado and orange. 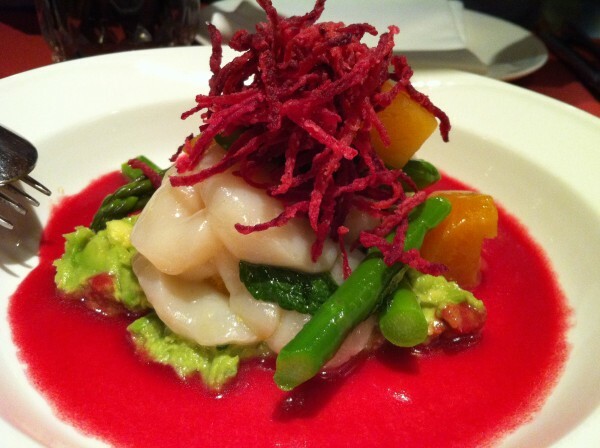 Served on a pristine white plate, the colors visually popped: the bright red from the beets and the vibrant green from the asparagus and the avocado paired with the muted creamy white of the scallops was stunning. We almost didn’t want to eat it, it looked so artful. The consistency was undeniably smooth, almost capable of sliding down your throat if you let it. Next up, the cod with macadamia nuts, celeriac and chorizo flakes arrived at our table. This one was probably my least favorite of the dishes we ordered not because it wasn’t good, but just compared with the others that we had that night, it wasn’t as good. As a dish it didn’t quite blow me away the same way the others did. The mix of flavors that came through with each bite had something missing – it wasn’t as well-rounded. There was no punch or kick or twist, more so a even-keeled monotonic flavor. Don’t get me wrong, I still enjoyed it. But if I would have to be critical about anything, this dish would be it. 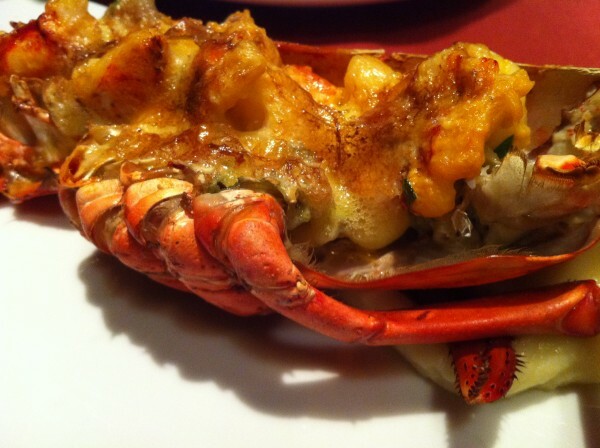 Our last dish was the half lobster which came already prepared for us. There’s little to no messiness involved when eating this dish, contrary to what you may believe when you see the item offered on the menu. All you have to do is fork the lobster meat out of its shell, make sure to get enough urchin on your bit and put it in your mouth. Easy to handle and absolutely delicious. I only wish that lobsters were a little bit bigger so that we could have more of it per half lobster ordered. Ughh, so good. At this point, we were feeling good. You know that point where you’re perfectly full but not to the point of bursting? Where you can still manage to keep your top button buttoned and walking to the car doesn’t present a relatively daunting challenge? That’s where we were. Not too full, not too hungry still. So, we went for the dessert. Best idea ever. 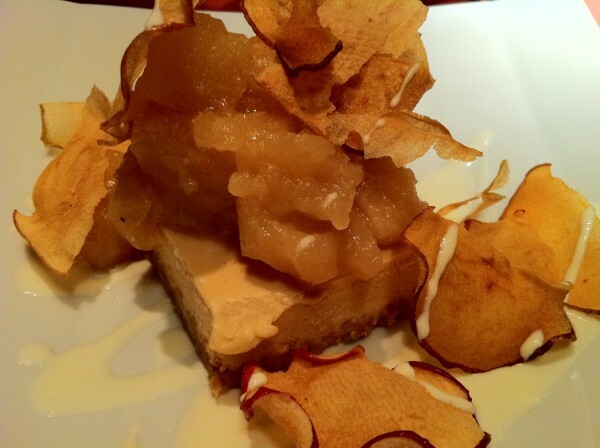 We both wanted the Dune, the apple cheesecake pictured above with a beautiful plumage of dried apples and real ones covering the real prize underneath. We settled on sharing that and the Melodie, a chocolate mousse cake that came with a thin, delicate swirl of chocolate garnished on the top, the bottom encrusted with a cluster of nuts. So yeah, if that wasn’t clear enough, we’re coming back. Tags: Apple Cheesecake, Beer, Beet, Campari, Cardeau, Champagne, Chocolate Mousse, Club Chasse et Peche, Cocktail, Cod, Dune, Flounder, forkandtell, La Piscine, Le Filet, Lobster, Melodie, Mont Royal, Morue, Scallop, Seafood, St. Ambroise, Tapas, Urchin.